You’ve probably seen it in the movies: the whole roasted pig with an apple in its mouth, but did you ever stop to think that apple was for anything besides window dressing? I didn’t either, but it turns out there’s more to it than that. Like other weird but delicious combos (apples and cheese, chocolate and cheese – try it!, etc. ), pork and apples works really well together. To make the pork and apple combo a little more suited to lunch though, I turned it from pork and apples to pork and potatoes… but cooked in apple cider. Bingo! Now this is a winning combo. A hint of sweet, apple flavor with the filling pork loin, sliced potatoes and cooked onions and some lovely parsley sprinkled on top. Awesome. Even better, it’s gluten-free, paleo and a one-pot meal. How much better can it be? So when you’ve got pork loin and no idea what to do with it to keep it interesting, try this pork and apple cider potatoes recipe – it’s a winner, both in time in the kitchen and ease of preparation. Slice the onion and peel and thinly slice the potatoes. In a large Dutch oven or casserole dish, arrange half the onions in an even layer. Top with half the potatoes, arranging in an even layer over the onions. Lightly season the contents with salt and pepper, then repeat with the remaining onions and potatoes. Pour the two cups of apple cider over the onions and potatoes. Season the pork loins with the paprika and creole seasoning, and arrange them on top of the potatoes and onions in a single layer. Finely chop up the parsley and top the pork with the parsley and rosemary. Bake uncovered for 45 minutes until the potatoes are tender. 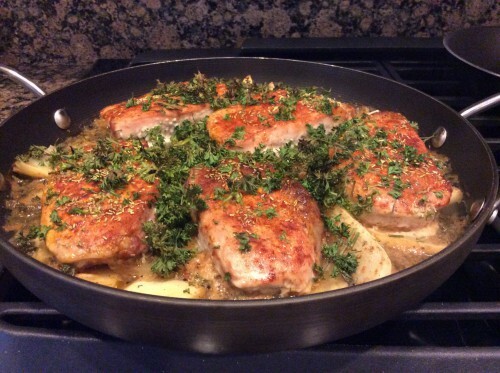 Serve the pork loins with potatoes and onions on the side. Doesn’t that look like an awesome one pot meal?